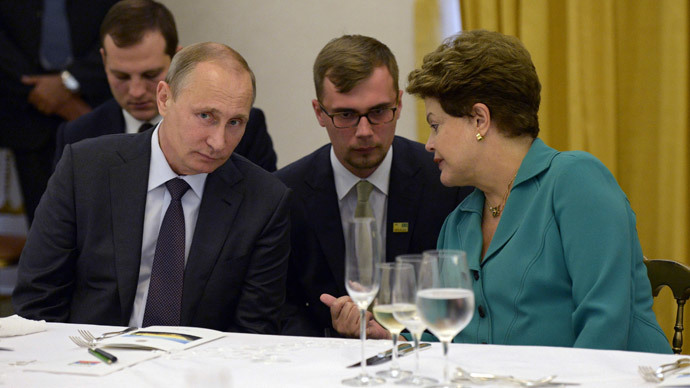 President Putin’s visit to Latin America is of transcendental importance at a time when the BRICS bloc is becoming something far more than a mere trade agreement, and where Russia is playing a key global geopolitical role. Russian President Vladimir Putin is in the midst of a truly historic tour of Latin America, visiting Cuba, Nicaragua, Argentina, and then on to Brazil for the 6th BRICS Summit being held in the cities of Fortaleza and Brasilia (with a quick Sunday stopover in glorious Rio de Janeiro where he watched the final World-cup match pitting Argentina and Germany). Ever since the tragedy of 9/11, the US, UK and its NATO allies (plus Israel) have become a danger to the world. Over the past thirteen years we have seen the overrunning of Iraq over false American and British accusations that it was harboring weapons of mass destruction that were never found; the destruction of Libya in 2011; the wanton engineered chaos of the “Arab Spring” that set countries like Egypt back decades; the near destruction of Syria; and the decade-long threats of preventive war against Iran over its non-existent military nuclear program. Estimates of Iraqi dead run into the hundreds of thousands, if not millions, and yet there hasn’t been one single apology from the US, UK or NATO. Today Iraq together with Libya is in the throes of civil war; Syria is slowly coming out of civil war and, most dangerously, Egypt is has fast withdrawn from its stabilizing role in the Middle East. All thanks to Western meddling and “engineered social chaos”, which is the new form of war being waged by the US, UK, NATO (and Israel). Confronted with growing failure in the Middle East, of late they have moved on to other latitudes: Ukraine, for example. While the Western powers had their way in Iraq and Libya, maybe in Egypt too, in Syria and Iran the US has been licking its wounds since Russia became the key counterweight against “Western Imperial Global War”. No wonder then that we are seeing them engineering social chaos in Ukraine, prompting Russia to reintegrate Crimea. Like the Four Horsemen of the Apocalypse, we see the US, UK, NATO (and Israel) time and again wreaking havoc in the Middle East and Central Europe; not just military violence which is always very visible as we see today with Israel’s genocidal tactics in Occupied Palestine, but also on the more subtle economic and financial fronts, ever since the Wall Street collapse of September 2008 began its ripple effect throughout the global financial and economic system. Sadly, after the Berlin Wall came down in 1989, mankind has had to deal with other more complex “walls”. In the 90’s, for example, Israel began erecting its over 800 kilometer-long, 20 meter-high “Wall of Shame” around occupied Palestine, with its humiliating checkpoints, armed soldiers, tanks, and barbed wire fences, transforming Palestine into a veritable prison; notably in the Gaza Strip which has been made into the world’s largest open-air concentration camp: a veritable “Auschwitz” in the Middle East! Throughout history, some walls have been offensive – the Berlin Wall erected by the former USSR in 1961 or Israel’s on-going Wall of Shame. Others, like Wall Street, have become a symbol of the global power elite’s protecting its immoral and criminal usurer mega-bankers against the working people. Today, we see how over the past eight years, a new Wall is being silently erected and has become a symbol of hope for today’s distressed world. Although not physically a wall as such and not made of “stone or bricks”, the BRICS wall is definitely in place and here to stay. The BRICS acronym was first coined by Goldman Sachs economist Terence “Jim” O’Neill back in 2001 to describe what they (and the Pentagon) identified as emerging markets that will become dominant by 2050. In economic terms for Goldman Sachs; in geopolitical and military terms for the Pentagon and their think-tanks worries. At the time, it encompassed four very important and diverse countries: Brazil, Russia, India and China; then in 2010, South Africa joined the group adding the “S” in BRICS and thus spanning four continents. The idea caught on fast amongst the very countries concerned which are now coming increasingly together and most definitely not under the aegis of either Goldman Sachs or the Pentagon. Since its first summit in Ekaterinburg, Russia in June 2009, BRICS has progressed a long way to becoming not just another trade-block bent on economic growth in US dollar terms and according to Western economic rules and philosophy. 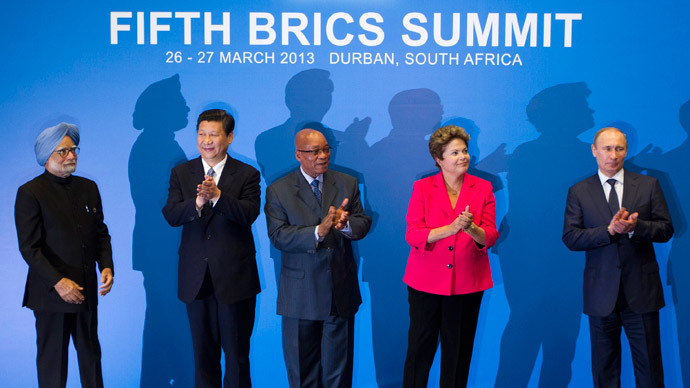 Quite the contrary: after a further four summits held in Brazil (April 2010), China (April 2011), India (March 2012) and South Africa (March 2013); BRICS has grown into what it is today: an increasingly consolidated geopolitical alliance of powerful countries bent on neither allowing the Western powers to call the shots in today’s world, nor to threaten them. In fact, three of those countries suffered horrible Western aggression and colonialism over the past century: India, China and South Africa. BRICS will not continue to allow the West to impose its currencies, its debt-based economic philosophy, its moral “values” and its money-dependant “democracy” on everybody. The IMF and World Bank were for decades the West’s financial control kingpins working for the mega bankers and promoting Washington and London’s geopolitical agendas worldwide. In 2002, the IMF went as far as promoting the idea that countries like Argentina should be declared bankrupt and their “assets liquidated” when they go into debt default, citing US Chapter 11 bankruptcy legislation as the way to go against sovereign countries. The IMF’s track-record bringing huge social hardship to countries like Mexico, Brazil, Argentina, Indonesia, Malaysia, Greece, Cyprus and even Russia is only too well known. BRICS’s new financial institutions will be capitalized to the tune of around $200 billion equivalents (with China putting in the lion’s share of $41 billion; Russia, India and Brazil $18 billion each, and South Africa around $8 billion). Back in 2001, Goldman Sachs economist Jim O’Neil never dreamed his idea would catch on in the uncanny manner that it has (uncanny for Goldman Sachs and the West, that it). After all, the people paying his salary then and now are bent on achieving exactly the opposite: making everybody bow to the IMF, the US Dollar, the FED and European Central Bank, the Euro and Goldman Sachs. As a member of Europe’s “Bruegel” think-tank led by none other than former European Central Bank chairman and Trilateral Commission/Bilderberg member Jean-Claude Trichet, they had - and have - other plans in mind. Today, he must surely feel like Dr. Frankenstein, seeing his “monster” break loose from the chains Master Goldman Sachs backed by Big Brother Pentagon hoped to tie BRICS down with. And a huge “monster” it is!! Today, the five BRICS countries account for 43% of the earth’s population, 23% of global GDP, 20% of global investment, and enjoy some of the highest economic growth levels in 2013 figures: China 8.2%, India 5.9%, Russia 3.7%, Brazil 3.5% and South Africa 2.8%. Add to that the 38.5 million square kilometers of their national territories and there can be little doubt that, at this pace, 2050 will mark the Age of BRICS. By then it will no doubt have chosen another name; by then the Western powers will have to put away their haughty “carrot-and-stick” tactics, becoming more humble, more cooperative, more serene, and more human in their actions and attitudes. BRICS today runs the risk of seeing an avalanche of membership request forms raining on its desk. Country after country is toying with the idea of joining BRICS. 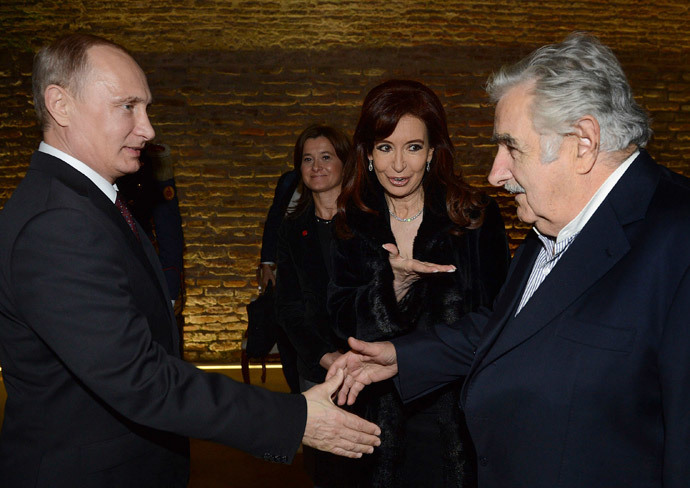 Take Argentina, for example, where Mr. Putin just met with President Cristina Kirchner, signing a cooperation agreement for an Argentine nuclear power plant. Although, it’s still too early for Argentina to join BRICS, it certainly seems to be a front-runner as next member. And rightly so! Many a South American country would do well to consider the BRICS option, especially after seeing the chaos wrought by Western “chaos engineering” in the Middle East, aka “Arab Spring”. That same chaos will eventually target South American countries not docile to US/UK interests. Latin America’s Pacific coast countries are traditionally pro-US/UK: Chile, Colombia (whose president Juan Manuel Santos is an Americas Society Rockefeller think-tank member), Mexico, Peru which are turning into America’s beachhead against the BRICS Wall going up in South America. Brazil: take note. Argentina: start defending yourselves! Don’t forget: since 1982 the UK and US have a nuclear base on the usurped Falkland Malvinas Islands, and since 2008 Baby Bush reactivated the 8th South Atlantic Fleet (that had lain dormant since 1953). The grand chessboard pieces are starting to fall into place in surprising ways that even Trilateral Commission founder and ideologue (and arch anti-Russian and pro-US) geopolitical egghead Zbigniew Brzezinski, never imagined. Maybe that’s the name of the game: starting to take the Western powers by surprise; doing things faster than they can intelligently react to; better than they can understand; subtler than they can even notice. Argentine President Juan Domingo Peron - himself a brilliant military strategist – once remarked that the key to a good strategy rests on two S’s: Secrecy & Surprise. BRICS’s notable on-going success seems to be doing things quite well in terms of geopolitical timing. For the Western powers, after their massive defeats in Iraq, Afghanistan, Syria, Iran, Asia in general and, increasingly, throughout Latin America, it’s probably already too late for them to react. They may very well have cornered themselves into a dead-end, with little or no way out… As Obama did over Syria last September. Might they use any one or a combination of them to kick the grand chessboard? Even a small “kick” can have devastating results: look at what happened exactly a century ago when the “shot heard around the world” was fired in Sarajevo. Let’s hope the BRICS wall continues to quickly strengthen, consolidate, grow and become so formidable, that no one will dare to trespass on it. 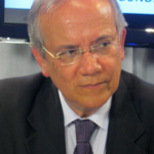 Adrian Salbuchi is a political analyst, author, speaker and radio/TV commentator in Argentina. www.asalbuchi.com.ar. He is also the Founder of the Second Republic Project – Proyecto Segunda República.